Nima Tolou, CTO of Kinergizer, has received the 2018 Engineer of the Year award, organized by the Royal Dutch Institute of Engineers (KIVI). This award highlights his role in the research and development of motion energy harvesting and the Zenith Defy lab. 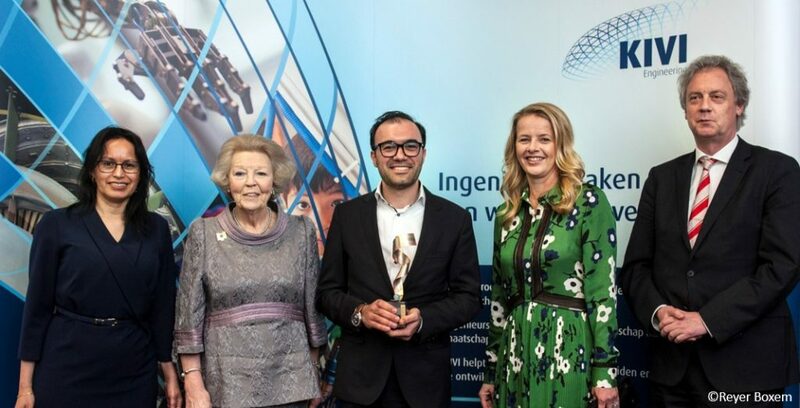 During the ceremony at the Day of the Engineer at the Groningen Engineering Center of the Rijksuniversiteit Groningen, in the presence of Princess Beatrix and Princess Mabel, Nima personally collected the price. The jury reasoned that: “The modern engineer is capable of addressing societal challenges via a scientific approach and convert these into breakthrough technologies. Nima has this capability, sees challenges and combines them into appealing research that helps improve the world piece by piece”. Nima responded to be ‘honored for the very nice recognition of not only my work, but also of the team as a whole’.